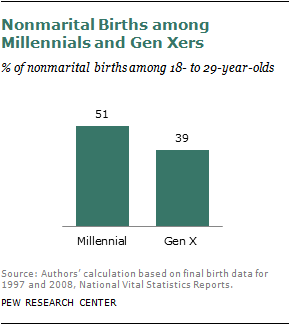 Wow, I didn't know the numbers were this high for Millenials. The more I read about this generation, the less I like them (not that I like X-ers or Boomers). The difference between the ghetto and the suburbs is shrinking. I could have used "The Blackification of the American Family" as an alternative title. The kids don't deserve the title of bastards though; the parents do. If current trends continue, we will soon see the day when the only people who get married are homosexuals. Sharia is coming, and this problem will disappear. Probably a lot of this is increasingly delayed first child - the average age of a woman having her first child in the UK has now risen to about 30. Of course, this also (almost certainly) means fewer children as well. The bastardization of the American family is also combined with late marriage, later births (or none at all), cohabitation, polygamy, open relationships, promiscuity, divorce, illegitimacy, gender confusion, narcissism and status. Upper classed liberal and libertarian women (SWPL women) are still getting married though they divorce at astronomically rates as well. They also have the choice of en vitrio fertilization and most of them have only 1 child or none at all. Since their wealth insulates them from much of reality they will continue this trend unabated (unless in the presence of a fiscal collapse and without a economic armageddon is arriving slowly on Western shores). Lower-class and middle-class women with higher religious rates will most likely on the future drop out of the liberal government stactioned form of marriage altogether because it would be too corrupted for them and just marry in Christian churches only without the government (kind of them dropping out of liberal schools and colleges and going for homeschooling and non-liberal Christian private universities). They tend to have 0-1 partners and most likely will stay together for a long time in a monogamous relationship. Non-religious lower and middle classed women will just cohabitate and have no formal arrangement for their partnerships. Most will have long-term relationships though some of it will also be short-term relationships since they have no ideals except what the higher SWPL class of women aspire for if they have lower IQ's.